We filled our Scarecrow Bags with a fall apple, but you can fill yours with anything that will fit! A great craft for fall treat bags, or as a great homemade decoration for the house! Preschoolers can do this craft if an adult does the first couple of "cutting" steps for them! * If you're going to fill your Scarecrow Bag with small candies or chocolate we recommend you put them in a baggie first! 2. Cut 16 slits around your felt circle (You can make more or less slits, just make sure it's an even number). Make your slits about ½" from the edge of the felt. 3. Cut a long piece of yarn and string it in and out of the slits all around your circle. 4. Make sure the ties are coming out from underneath the felt circle (if they aren't just flip it over - see picture). Cut strips of felt about 3"-4" long and glue them all around the edge of your circle. 5. Place your apple (or goody bag) in the center of the felt circle and pull the yarn ties to so it pulls up and over the apple - like a bag. 6. 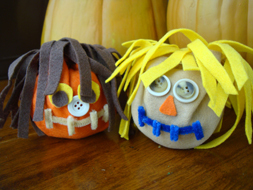 Use scraps of felt or foam, buttons and pipe cleaner to make the face on your scarecrow. Go ahead and clip off some of the felt hair if you think your Scarecrow needs a hair cut!